Join this fascinating kitesurf camp for all levels in beautiful Morocco. This is the best kitesurf camps for you who are eager to learn how to kitesurf or just want to take a trip out of the office while enjoying the beautiful Moroccan sunshine. 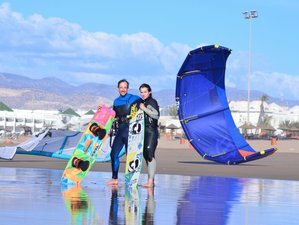 This kitesurfing camp in Morocco is an unforgettable experience where you will find qualified instructors who love to share their knowledge while meeting people from all over the world. The camp is a traditional villa featured with 14 rooms which consist of single, double, 3- or 4-bed room. It has a sunny roof terrace with sea views, a patio and a lounge with TV and DVD, and free Wifi. All rooms have a private shower room with toilet. Located on the Rue de Essaouira, 5 minutes drive south of Taghazout in the village Tamraght. It is also just a mere walking distance to different surf spots/beaches: Banana, Devils Rock, CrouCrou. You can truly enjoy your stay while learning how to surf peacefully and efficiently. You will start your day with a healthy breakfast at 7:30 a.m. At around 9:00 a.m., the crew will take you to the best kitesurf spots depending on the wave and wind conditions. From 9:30 a.m to 12:30 p.m., your kitesurf instructors will be in the water with you for three hours of kitesurfing lessons, and they will teach you all the techniques you will need to improve your skills. At 12:30 p.m. to 2:00 p.m, it will be the lunch time and you will take some rest before your second surf sessions. Your second kitesurf session will start at 2:00 p.m until 4:00 p.m. to practice what you have learned and, of course, your instructor will be there with you. After your kitesurfing session, the crew will take you shopping in Agadir market or to explore the city. In the evening, you will have free time to go out and enjoy the nightlife. On the last day of your camp holiday, the crew will take you to spend the whole day in the mountains at one of most beautiful places in Agadir called Paradise Valley. There, you will have the opportunity to try cliff jumping or simply admire the beautiful surroundings. You will have a one day trip to Paradise Valley and a visit to Agadir local market as part of this retreat package. Abdou will be your instructor. He is a surf coach who has been practicing since 2008. Soufiane is one of the instructors of Swell Surf Morocco. Hamza is one of the instructors of Swell Surf Morocco. The retreat will take place in Tamraght, just north of Agadir, one of the best surf and kitesurf destinations with a beautiful coastline in Morocco. The atmosphere is very tranquil, relaxed, and sunny almost all year round making this place a perfect for surfing. During the camp, you will be provided with daily delicious Moroccan breakfast and lunch which are already included in the package. In the evening, you will have your free time to enjoy your nightlife to visit some bars and nearby restaurants that offer various selections of meals and drinks. During your free time, you are always encouraged to try other beach activities like jet ski, parasailing, and surf lessons offered by Swell Surf Morocco. You can also enjoy the tour to Marrakesh, Essaouira, or Elzira at additional cost upon request. Hammam and other massage treatments are available upon request at additional costs. Please book your flight to arrive at Agadir-Al Massira Airport (AGA). Transfer from and to the airport is included. Swell Surf Morocco will pick you up from the airport. Swell Surf Morocco is a dream camp for unforgettable surfing and kitesurfing holidays located in a small fishing village to the north of Agadir.